We tested our tents over several weeks, across a 3-month time span to try out the tent in a variety of elements such as hot days, cool nights, and rainy afternoons. We’ve determined that the Zomake Pop Up Tent is the best instant tent all types of camping trips from solo outings to a family getaway for several reasons, which we’ll outline below. 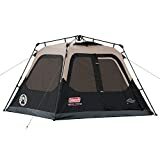 This tent is lightweight, simple to set up and take down, and can easily make even the least experienced camper feel confident about setting up camp. After testing several pop-up tents that claim to be spacious, the Zomake Pop Up Tent is roomier (and comfier) than others we tested. We wanted to test out an instant pop up tent, that wasn’t as roomy as the Zomake Pop Up tent, to see if we could still sleep comfortably under the stars. FiveJoy’s Instant Pop Up, while a little smaller in size, has many of the same features we love about our favorite tent. This runner up is the perfect pick for a small, out of the way campsite or when wanting to camp/pack light. 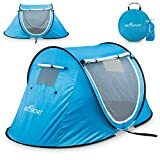 Selecting the best pop up tent was a little more complicated than we initially thought, as there are a lot of pop up tents on the market. Although we tested out several with similar features to our favorite and our runner up best instant tent, most of the pop ups are smaller in size, take a little extra work to set up, and aren’t as convenient to carry when wanting to pack light. Coleman has a long history of making high-quality tents. We tested out the Coleman Pop-Up Tent, and while it was relatively fast and easy to set up, we were left wanting more, size-wise. 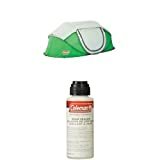 At first glance, the Coleman Instant 4-Person tent looked a little difficult to set up. While it’s a fast and easy setup, it takes a little more time than some of the other instant tents. We were disappointed that the rain fly was not included but can be sold separately. Although this model is roomier than the Coleman pop up, it’s unlikely that four people would sleep comfortably. We had to try out this pop up because it’s described as “an automatic instant portable cabana beach tent.” Who doesn’t love camping on the beach? While the Abco Tech Pop-up Tent was easy to set up like other pop ups we tried, it was kind of tight on space. Tent camping is a quintessential summer activity and even year long for those who live in agreeable climates. Many campers purchase large, 8-people tents that require using an instruction manual every time and setting up tent poles. Setting up and taking down can be frustrating and time-consuming. Pop-up and instant tents are more portable and have an easy set up so you can spend more time doing other things like going on a hike or building a campfire. There is a large number of pop-up tents available, and while the design concept is similar, the features may vary greatly. Before you buy, we believe it’s best to know what you need and what you expect from a pop-up tent. Choosing the right tent can make you a happier camper every time you sleep beneath the stars. In this guide, we will examine a few select features and options when camping out in a pop-up or instant tent. If you have been thinking about an easier way to camp, you may be the perfect candidate for a pop-up tent. 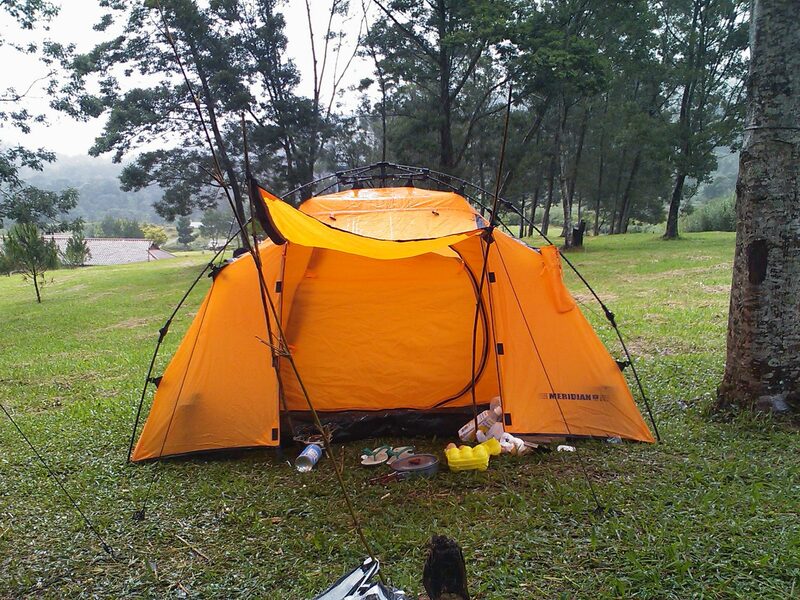 As you would with any other type of tent, occupant size is important when selecting a pop-up tent. While there are a few pop ups that are described as large enough to hold a family of five, you need to think about whether the occupants are adults or children. You also need to think about if you’re planning on storing your gear in the tent, too. A good rule of thumb is to buy as big as you can. 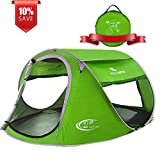 For example, if you’re looking for a tent for solo camping, you will probably be fine in a one to two person tent but if you want a little extra room go for a four-person tent. One of the many advantages of a pop-up tent is that they are lightweight, portable, and don’t take up a lot of space. This means you can buy more than one, such as one for adults and another for kids. Multiple tents allow for an even more comfortable camping experience. If you’ve ever camped out in a traditional tent with poles, you know it can be a frustrating experience. Not only can it be time-consuming but it often requires more than one person to set up the tent and factors like wind, rain, and low light can make it even more challenging. 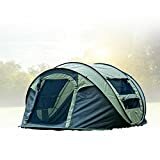 Pop-up and instant tents are designed to set up (virtually on their own) is less than a minute; some even claim to go up in less than ten seconds. Takedown may take a little more time but should be just as stress-free. 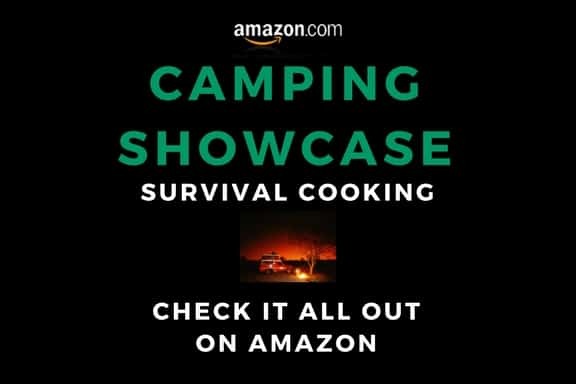 Want to make sure you know exactly how it works before you go camping? All you need to do is set it up in the backyard or in a large room indoors. Pop-up tents are considerably lighter and smaller than traditional tents but as you start to shop around you may notice varying weights and sizes. Again, the size of your pop-up will greatly depend on how many occupants you have. Another size factor has to do with the size when it’s stored. Some pop-ups fold down into a “pancake” while others just lay flat. Many pop ups weigh around or less than eight pounds. If you’re planning on pulling right up to your camp spot and taking the gear out of the car, weight probably isn’t much of an issue. Hiking or walking into a campsite are different factors to consider, and you will want something lightweight and easy to carry. There are a few additional features to consider when thinking about weight and size. Even though you don’t need to set up the tent there are poles already put together, creating the frame of the tent; these are usually lightweight and made of fiberglass. If you want a little extra room, look for pop ups that have a vestibule as this can be a perfect place to store gear and offer added protection from the rain and the sun. One of the great things about camping is that anyone can do it and you don’t need a lot of experience. When considering a pop-up tent, think about the how, where, and when you camp. Do you camp in the summer or fall? During rainy weather? Do you prefer out of the way spots or designated flat camping areas? Most pop-ups will hold up well in rainy weather with light winds, but you will want to use the rain fly and stay on flat ground; water-resistant fabrics are always the smartest choice. If you want to camp in cooler weather, you may need to bundle up as pop ups aren’t designed for cooler weather camping (although temperature and comfort vary from one camper to the next). If you like the idea of light packing and heading out for a spontaneous getaway, camping in a pop-up is probably for you. Once you have found the perfect tent, take the time to do a trial run at home on a flat surface, in daylight hours, and preferably when it’s not raining. Although pop-ups are easy and quick to set up, give yourself a little practice first.